Home / Entertainment News / VIDEO! Here’s the taxi driver who ferried MARY WAMBUI’s body after she was murdered by the hubby’s mpango wa kando at FourWays Junction. VIDEO! Here’s the taxi driver who ferried MARY WAMBUI’s body after she was murdered by the hubby’s mpango wa kando at FourWays Junction. 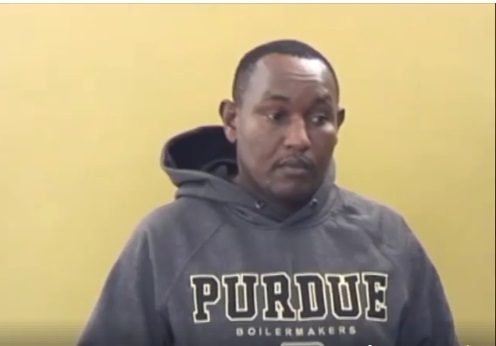 Thursday, February 7, 2019 - A third suspect who participated in the gruesome murder of the late businesswoman, Mary Wambui Kamangara, has been arrested and arraigned in court. Michael Githae, a taxi driver, is believed to have ferried Mary’s body from Four Ways Junction along Kiambu Road and dumped it in a dam in Juja. Mary was killed by her husband’s mpango wa kando Judy Wangui after they engaged in a scuffle inside her house. According to the police, the taxi driver has known Judy - the prime suspect in the gruesome murder of Mary Wambui - since 2016. He appeared before Kiambu Senior Principal Magistrate, Stella Atambo, but did not take a plea. The Magistrate ordered Michael to be held for 7 more days as investigations continue. Here’s a video of the taxi driver when he appeared in court.